To celebrate, Land Rover is launching a new Landmark Edition of the Discovery Sport. Since the SUV launched in 2014, Land Rover has sold more than 350,000 units of the . Last year alone, the automaker shipped 126,078 units, making the the fastest-selling Land Rover of all time in the company’s 70-year history. To celebrate this staggering sales record, the Land Rover is launching a new special edition of the . Called the Landmark Edition, the commemorative SUV offers a unique color and trim combination. Three colors are available: Narvik Black, Corris Grey and Yulong White, with a contrasting Carpathian Grey roof. 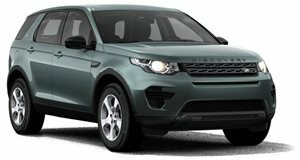 Further distinguishing the special edition SUV is a sportier front bumper with Graphite Atlas exterior accents and unique 19- ‘Mantis’ wheels in Gloss Dark Grey. Inside, the interior features Ebony grained leather seats and an Ebony headliner, complemented by dark grey aluminium finishers around the center console. “The is loved by customers because it demonstrates the breadth of Land Rover’s ability, offering unrivaled all-terrain capability with the versatility for up to seven people and a premium interior,” said marketing director Finbar McFall. “We have sold more than 350,000 s globally since its introduction in 2014, with 126,078 models sold in 2017 – the best single-model annual sales in Land Rover’s 70-year history.” The Rover Landmark is available with a choice of two Ingenium 2.0-liter turbocharged four-cylinder engines, including a 180-hp diesel and a 240-hp gasoline version. Both feature particulate filters that are now being fitted across the entire range. Orders for the Land Rover Landmark are now open in the UK with prices starting at £40,400 ($53,703).